CRIME, GUNS, AND VIDEOTAPE: San Diego Sheriff Announced he Won’t Appeal from 9th Circuit Appellate Decision Striking Concealed Weapon Ban! San Diego Sheriff Announced he Won’t Appeal from 9th Circuit Appellate Decision Striking Concealed Weapon Ban! San Diego, CA—Yesterday Sheriff Bill Gore announced that he wouldn’t appeal the decision in Peruta vs. County of San Diego. That of course was the ruling that struck down California’s ability to obstruct the issuance of concealed weapon permits to law-abiding people requesting them. The permits were nearly impossible to obtain in the state's most populous jurisdictions. Officials had the power to arbitrarily and capriciously deny permits. Only the politically powerful, very wealthy or connected applicants got the permits. Some California Sheriffs would routinely and nefariously sell the permits to their campaign contributors. Under the now invalidated law CCW permit applicants had to prove "moral fitness" and a compelling need for the added protection. Those nebulas factors were so incredibly vague that they were void. Despotic California sheriffs and police chiefs got away with violating the Second Amendment rights of citizens for decades. Several plaintiffs sued and when the case finally reached the Ninth U.S. Circuit Court of Appeals California’s long-standing but unconstitutional concealed weapon permit law was shot down and invalidated. The obvious reason for not appealing the case to the U.S. Supreme Court is that the high court’s recent rulings in the Heller and McDonald cases solidly reaffirmed the right to not just keep but to carry arms outside the home. By not appealing it the gun banners are seeking to avoid total destruction of their ability to regulate the permits and violate the privacy of applicants. Politicians in a few other Leftists run states don’t want SCOTUS making yet another ruling that would have an immediate impact on their own various gun bans. There’s no doubt that these other jurisdictions have been in communication with California gun ban proponents. Just what hat does this all mean right now for California’s millions of gun owners? It means that prosecution of cases involving the carrying of concealed weapons by otherwise law-abiding people is impossible. The law was invalidated pure and simple. California must now rewrite their law to cure the defect. They can’t just simply create new obstacles to replace the old ones. Until then Constitutional carry will be the law of the land. I’m sure a few cops will make some bogus arrests that will fail in court later. Anyone currently charged with a CCW offense would be crazy to enter into a plea agreement. Litigating the matter citing Peruta vs. County of San Diego along with the Heller and McDonald cases would bring certain vindication. There are still serious issues with non-California residents and thousands of security guards with so-called Exposed Weapon Permits that need to be addressed. It would save California taxpayers millions if the simply took the exposed weapon permits and relabeled them additionally for concealment. The holders of these permits have already completed background investigation and training requirements. No need to do anything with these permits but to simply rename them carry permits that allows both exposed and concealed carry. There is no reason to redundantly relicense thousands of security guards and private investigators to deal with parallel requirements and costs. California's Bureau of Investigative and Security Services has already satisfied any and all present or future needs. The BISS weapon permit program that’s already in place has more than adequately addressed all of the public safety needs and Constitutional questions. So Paul, out of curiosity what does this mean for people with CCW permits from other states? Are we safe to have our weapons in a locked compartment in our cars, or is there a yet to be determined reciprocity on CCW? My partner and I have people in the L.A. area we wouldn't mind traveling from AZ to see, but we will not support that state as long as they don't support our rights. Is this truly a turning point? I know this is a bit confusing. The cops, prosecutors and judges will be scratching their heads on this issue too. I’d give a couple of weeks for this decision to sink in to various California officials before risking arrest. Prosecutors will quietly tell the cops to avoid CCW arrests unless there is some legitimate breach of the peace involved. Remember two things: The CCW law was declared unconstitutional. That means it cannot be enforced. Cops might still make an arrest out of ignorance but there will be no convictions. CCW arrests are rarely made without accompanying charges that led to a search and discovery of the concealed weapon such as DUI. Once they rewrite the law freeing it from its current Constitutional violations the new law will have to be obeyed. They will have to allow out-of-state visitors a method to obtain the permits or approve reciprocity for visitors. Currently they cannot be prosecuted either. The next several months will probably be a free-for-all but once things settle down under a new Shall Issue program. Carrying outside the new law will be at your peril. Trust me California Officials won’t tell you the can’t prosecute you while they argue about an rewrite the law. Paul, you say, "There is no reason to redundantly relicense thousands...", and this is true. Despite this rational thinking, they will construct another set of hoops and fees to delay and tax the 2nd Amendment right. I was opposed to LB454 in Nebraska in 2006 not because of the training requirement, but because of the "permit fee"($100/1st 5 years)on a Constitutionally guaranteed right. The application fee to provide CCW training is $15 and a Nebraska OLN is $26.50. Seems like a tax to me, and Cali will see dollar signs too. You’re not wrong that California Authorities are gun-rights haters and would put in place every delay, tax and obstacle in the way of compliance with the Second Amendment. The CA despots will be under the watchful eyes of the plaintiff’s lawyers and the 9th Circuit Court. They certainly can’t raise the fees nor do much of anything to delay the permits. If they hope to have any ability to regulate concealed weapon or require permits they have to put in place a new law that meets Constitutional requirements. A Second Amendment Tax is no more valid than a Poll Tax. Until they put the new law in place enforcement the old voided law has ended. Let me add that prosecutors will be advising cops not to book those violating the stricken CCW law into jail under any circumstances. I do't rule out that people may be cited and released and see their weapons confiscated until some judge can figure out what to do. As I've stated b-4, ALL Firearms bought legally in the U.S.A. ARE registered. That's what the paperwork a buyer fills out at time of purchase is for. If not, only a sales receipt would be necessary, instead of all Federal-ATF-Related Paperwork, and Waiting Periods. Buyers are also by Law responsible for keeping a record of a sale of a firearm if they sell it to a private individual, and assuring that person is legally allowed to own a firearm.. Politicians are playing Games with, and wasting the Taxpayers Money, via personal financial in-accountability, in constantly pushing for more Restrictive , redundant, firearms legislation, mainly because they pay for all of it out of the unwitting Middle-Class Taxpayers pockets, NOT their own. If they had to pay for these Un-Constitutional politically-related Scams and schemes themselves, they would never cough up a dime of their own money to do so, but wasting ours is just fine with them. Taxpayers should WTFU, and demand these scamming Gun-Control-Backing Politicians use Tax Dollars for constructive things, like creating private-sector jobs for , American Citizens, Oil-Gasoline , Energy Development, Welfare-to-Work Programs, paying down the National Debt, securing U.S. Borders, Middle-Class Tax-Cuts to stimulate the Economy, etc. Then there's the fact that when a Law-Abiding Citizen is wrongly arrested by overzealous "Nazi" type Cops, and a lawsuit is instituted and won by the wrongly arrested Citizen, who again pays? Yes. Actually, the Middle-Class Taxpayer Chumps, [aka, us]. Punitive Damages should be paid by the politicians , and the law-violating Police Officers involved, but the big money for Lawyers is in hitting the Government run Police Department in the Wallet, and that equals out to us, the Taxpayer, again paying for someone elses incompetence, over-zealousness, and harassment under color of the Law. This needs to be stopped. Hold those who are accountable personally accountable, via mandatory punitive damages, and watch how fast the harassment , illegal searches, seizures, and arrests of Law-Abiding Firearm Owners stops. The politicians who allow this conduct by their police Agencies again remain un-accountable, and walk away with a slap on the wrist. Hold the politicians and individual Officers personally responsible, for ALL Punitive Damages. The time is here, and the time is now, for holding these scamming politicians 100% responsible for the way they spend OUR Tax Dollars. Please join the NRA, people, they are pretty much our last hope for the freedom of owning a firearm in the U.S. thank you. What type of gun is that in the picture? I'm looking for a gun for concealed carry here in Illinois. Wow, I still can't believe it finally happened here! 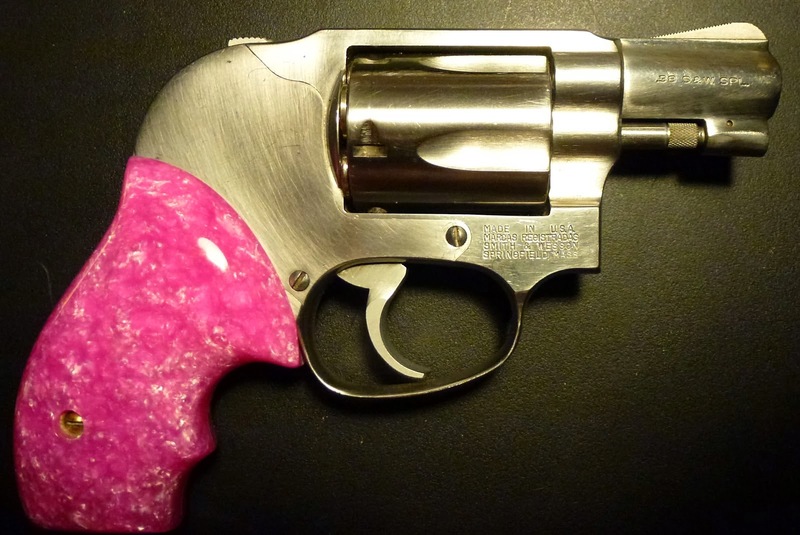 The revolver shown is the Smith & Wesson #649 Bodyguard .38 special 5-shot. This one is equipped with a pair of Kirinite Secret Service grips from Eagle Grips www.eaglegrips.com. They have a large assortment of materials. The Kirinite materials come in a wide range of intense colors. They are non-slippery and tough has nails. Why I Hate Spirit Airlines and So Should You! Phillip Seymour Hoffman, We Hardly Knew You!